DESCRIPTION of Antiference 4 Way TV Amplifier with Bypass (F-Type) Manufacturer: Antiference UK. 1x Labgear PUH141. Amplifier fixing options are standard cable tie, mast mount or flat surface fix. Lower gain (9dB) is ideal for digital aerial installations where a higher gain will lead to picture break up of picture. 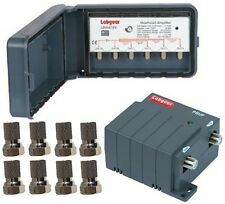 Labgear HDU641 Satellite Distribution Amplifier TV, DAB, CCTV, FM, up to 4 TVs. Boosts signals even in poor reception areas. Improves your TV picture especially in poor reception areas. 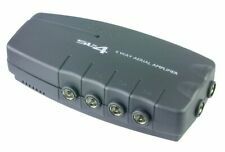 SLx4P Plug in Aerial Amplifier - 4 Way Digital Freeview. Philex SLx 4 Way TV Aerial Amplifier with Digital Bypass and 4G Filter. 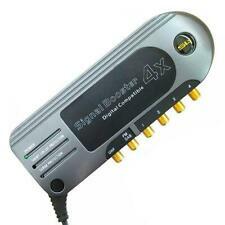 Labgear 2 Inputs & 4 Outputs DigiLink TV Distribution Amplifier & Signal Booster. Labgear SDA243 Stepped Power 4 Way TV Signal Distribution Amplifier. 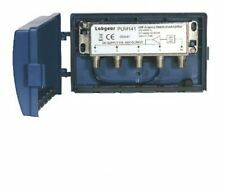 Labgear LDL104R TV Distribution Amplifier for Sky with 4 Outputs. Video combiner & amplified 4-way splitter housed in 1 chassis. 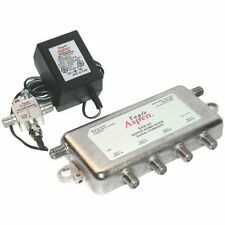 EAGLE ASPEN SHN24-KIT Signal Combiner/Amplified 4-Way Splitter. Distributes all off-air or CATV signals plus 1 UHF modulated signal to 4 TV outlets. Optima SP4 4 Way Terrestrial TV Signal Splitter with Weatherproof Housing. PART NUMBER:SV9542. Part Number SV9542. 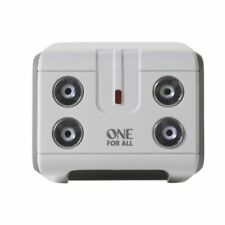 One For All Way Amplified Signal Splitter. Variable gain (10-20 dB). Number of inputs: 1. Number of outputs: 4. Compatible with analogue & digital signals. Optima MA20-4KIT 4 Way Masthead Amplifier (TV Signal Booster) and Power Supply. Increases your TV or FM/DAB aerial signal. O Model Number: AP864. o 2 inputs ; VHF/UHF and UHF only. Indoor distribution amplifiers are usually mounted within a roof cavity, or under floor. They take a good input signal and distribute it, whilst also adding a small amount of gain. 4 WAY UHF COAX PLUG BOOSTER. Argos will then notify you when your order is ready for collection. Number of inputs: 1. Number of outputs: 4. Variable gain (10-20 dB). ALL GOODS ARE SECURITY MARKED. 4 WAY SPLITTER UHF/VHF/FM WITH D.C POWER PASS FACILITY. CAN BE INSTALLED IN THE LOFT TO DISTRIBUTE TO EXTRA TV OR DIRECTLY INTO A DISTRIBUTION AMPLIFIER IF MORE SIGNAL OR LONG CABLE RUNS ARE NEEDED. CABLE FIXING VIA SCREW/CLAMP. Professional distribution amplifier. Two inputs for DTV and Radio signals with 4G filtering on the DTV input. Amplifier automatically detects a masthead pre-amp on the DTV input and switches on line-power. 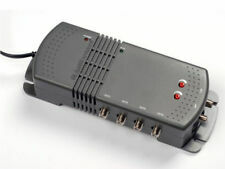 Nikkai Aerial Amplifier with Digital Bypass 4 Way. • Split and distribute the signal from an aerial, Sky box or Freeview box• Built-in digital bypass for use with Sky remote extenders (such as our PT73Q Sky Link)• Up to 12dB gain to each output• Short circuit protection on each output• Less than 5W power consumption. SHINYBOW 4 AV Distribution Amplifier - SB-3714 - New. SHINYBOW 4 AV Distribution Amplifier - SB-3714 - New..
AntSig Antenna Distribution Amp. The unit also includes surge protection and short protection. If this is not the case, we will also suggest the best course of action. Audio Visual. Personal Audio and MP3 Players. Can provide firmware for TDX upgrade to version 4.8.1.40682. 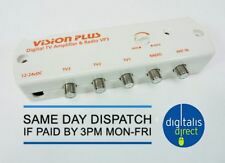 The Vision Plus VP5 Digital Amplifier is designed to enhance the performance of all non-amplified directional TV antennas. There is also a non-amplified outlet for FM Radio reception when used in conjunction with a UHF/FM antenna. This unique product also incorporates a dedicated Signal Finder which will enable you to locate the strongest available digital TV signal. This powerful amplifier with high gain and low noise capabilities will ensure improved performance especially in poor reception areas. Manufactured by Philex this four way amp is designed to feed your existing Sky channels and increase TV signals to four TV's. Freeview HD. Caravan and Camping. Sky Digital. • Hi-Fi tuner can be connected to either of the booster outputs. Konig KN-PROAMP24 CATV Amplifier. • Frequency range: 86 ~ 1006 MHz. • Amplifier. • Output: 4. • Output level: 95 dBuV min. • Wall mount fittings. • Instruction leaflet. • EU 2-pin 100-240V AC mains power adapter. A240lr-pro lte distribution amp with 2 inputs (vhf/uhf) and 4 outputs. 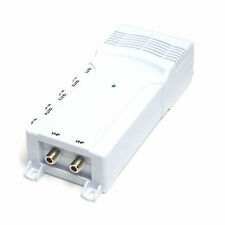 1 x 4 port VCR TV Signal Amplifier Booster (with 5 joints). If using several TV sets, this amplifier will boost the signal before distribution. Input: AC 220V ±15%, 50-60Hz. Low noise circuit design. Output port: 4. • Two screws attached. • Zinc Die-Cast housing with Nickel Plating. Looking for related products?. 470-1000 MHz: 1.337. 40-470 MHz: 1.222. 5-40 MHz: 1.228. VSWR IN and OUT. 470-1000 MHz: > 23. Designed for both digital and analogue reception in communal installations. Low current consumption. In addition to supporting the new Sky Q system the dSCR products support backwards compatibility to older Sky boxes and industry communication standards EN50494 and EN50607. Distribution amp with instructions. Surge protection , power light, good quality Bought but never used as not suitable. Not boxed.